How do we discuss music? How can we use words to describe what a piece of music expresses? What makes a masterpiece? Are artists lionized in their own lifetime or does canonization and the idea of a masterpiece happen over larger periods of time? Who makes music in the Western Classical tradition? Who is the author? Melody - A sequence of musical notes, often, but not always, singable. Harmony - Notes played together, often, but not always in concord. Chord - Three or more notes sounding at once. Orchestration - How the musical material is performed; what instruments play and how they play. Timbre (or tone color) - The quality of a sound, the sound of a musical instrument. Rhythm - The arrangement of sounds over time. Tempo - The speed of pulsation underlying music, usually expressed in beats per minute. Meter - An hierarchical rhythmic structure, usually a repeated pattern of strong and weak beats. Form - Overall architecture or plan for a piece of music. Usually how a piece of music is divided into sections. Phrase - A short section of music with a sense of completion. A Papyrus thought to be Euripides’ Orestes, a musical drama from the fifth century BC. How accurate can a recreation of this music be today? Below is a recording by Alekos Karavitis, a Cretan musician of traditional folk music. Some of the phrasing and ornamentation that we hear in folk musics could provide insight into interpreting ancient music notation. Notice the similarities and differences between these two score examples. Do the groupings of notes (neumes) look the same in both? How many horizontal lines are there per system and what might this imply about the notation? What information is not seen in either example that might be expected in a modern score? What aspects of performance might be left "unsaid" in a musical score? Notation was originally an aid to memory, but over time became more and more specific, allowing musicians to read and learn music that they never heard. The unification of the church during the Carolingian Renaissance (9th century), and most notably under the rule of Charlemagne, saw a surge in cultural and artistic development. During this era there was a push towards standardization in all practices of the church, which created a demand for music notation so that the same mass could be realized in any location where Christianity was practiced. Music notation was also thought of as being more advanced and efficient in teaching music than oral transmission. However, this does not mean that the oral tradition disappeared, only that music making was streamlined via a common practice regarding the interpreting musical scores. Plainchant is a monophonic music in a free meter. This means that all voices sing in unison without a clear rhythmic pattern. Plainchant is sometimes referred to as plainsong or Gregorian chant, and these terms may be used interchangeably. This music is religious, used in the Christian liturgies of the Western Church with origins from antiphonal singing that was practiced in the Christian places of worship in Syria and Egypt dating back to the 4th century. The predecessor to plainchant would be a kind of incantation or heightened speech used when delivering religious texts to elevate the importance of the words and their meaning. The Kyrie contains long melodic passages where the vowel does not change, which are known as a melismas. "I used to be much more fascinated by the pleasures of sound than the pleasures of smell. I was enthralled by them, but you broke my bonds and set me free. I admit that I still find some enjoyment in the music of hymns, which are alive with your praises, when I hear them sung by well-trained melodious voices. But I do not enjoy it so much that I cannot tear myself away. I can leave it when I wish. But if I am not to turn a deaf ear to music, which is the setting for the words which give it life, I must allow it a position of some honor in my heart, and I find it difficult to assign it to its proper place. For sometimes I feel that I treat it with more honor than it deserves. I realize that when they are sung these sacred words stir my mind to greater religious fervor and kindle in me a more ardent form of piety than they would if they were not sung; and I also know that there are particular modes in song and the voice, corresponding to my various emotions and able to stimulate them because of some mysterious relationship between the two. But I ought not to allow my mind to be paralysed by the gratification of my senses, which often leads it astray. For the senses are not content to take second place. Simply because I allow them their due, as adjuncts to reason, they attempt to take precedence and forge ahead of it, with the result that I sometimes sin in this way but am not aware of it until later. Sometimes, too, from over-anxiety to avoid this particular trap I make the mistake of being too strict. When this happens, I have no wish but to exclude from my ears, and from the ears of the Church as well, all the melody of those lovely chants to which the Psalms of David are habitually sung; and it seems safer to me to follow the precepts which I remember often having heard ascribed to Athanasius, bishop of Alexandria, who used to oblige the lectors to recite the psalms with such slight modulation of the voice that they seemed to be speaking rather than chanting. But when I remember the tears that I shed on hearing the songs of the Church in the early days, soon after I had recovered my faith, and when I realize that nowadays it is not the singing that moves me but the meaning of the words when they are sung in a clear voice to the most appropriate tune, I again acknowledge the great value of this practice. So I waver between the danger that lies in gratifying the senses and the benefits which, as I know from experience, can accrue from singing. Without committing myself to an irrevocable opinion, I am inclined to approve of the custom of singing in church, in order that by indulging the ears weaker spirits may be inspired with feelings of devotion. Yet when I find the singing itself more moving than the truth which it conveys, I confess that this is a grievous sin, and at those times I would prefer not to hear the singer." Hildegard von Bingen was a German benedictine abbess and polymath. She is notable as a composer, philosopher, linguist, medicinal writer, biologist, and is considered to be the founder of natural history in Germany. She was also a mystic, claiming her discoveries and writings were divined from God. She describes receiving visions from a very young age in her autobiographical work, Vita. As an abbess, she consistently fought for more freedom and independence for herself and her fellow nuns. Saint Hildegard's claim that her writings were visions may have allowed her to overcome the patriarchal hierarchy of the church and have a say in matters that would typically not be allowed to a woman. she claimed that she was an unlearned woman and incapable of the discoveries that were divined to her, which also allowed her to more openly criticize church corruption and practices, making calls for reform as she toured Europe speaking to both clergy and laity. This does not mean she was allowed to speak completely freely and without consequence or universally accepted as a visionary. Hildegarde von Bingen alo produced some remarkable pieces of visual art, which were also a product of her ecstatic visions. How does this performer embody this music? Does the expression of the music change when you can see the performer? What would be the experience of hearing something like this performed live? If you were asked to write a text describing this music and what it expresse, what would it be? Listen to the first fifteen minutes of this work. Ordo Virtutum is considered to be the first Christian morality play and is the only surviving musical drama from the medieval period. The music and story originate from one of Hildegard von Bingin's visions and tells the allegory of a soul (anima) struggling between the virtues and the devil. Do the technical limitation of monophony limit the music in some way in terms of musical interest or expressiveness? How might this music relate to mystical or religious experience? In Ordo Virtutum, the personified virtues sing, while the devil is only able to shout. What does this tell us about the nature of music and how it was understood in terms of Christianity? Léonin and Pérotin were the two preeminent composers of early polyphony in the ars antiqua (c1170-1310) period. These two composers are the only two named composers of the Notre Dame school, who were a group of composers, scholars, and theorists working at the Notre Dame Cathedral in Paris, an important center of scholarship and cultural innovation at the time. Their names were passed down by a student and music theorist known as "Anonymous IV," who mentions these two composers in their notes. The Notre Dame school is known for two important innovations. The first is the early form of polyphony, where multiple voices sing independent melodic lines simultaneously. The second innovation relates to the notation of rhythm, where these composers used a form of notation developed by Franco of Cologne that allows for more precise rhythmic notation. Sing joyfully to God, all the earth. The Lord has made known his salvation. He has revealed His righteousness. Compare and contrast these two musical examples. What are the differences and similarities? Can you hear the number of independent voices in each of these examples? How do these musical examples compare to the monophonic plainchant from the previous class? Is it easier or more difficult to understand the words? Does the polyphonic music feel like a development of the monophonic music? William IX (Guilhèm de Peitieus) is perhaps the first well-documented Troubadour, a singer-poet from the medieval era. This song is in a language called Provencal or Occitane, a language from Northern France in the Medieval period. William IX was a Duke who led the 1101 Crusade and generally led a rocky life, in and out of favor with the Church. You may get a sense why he was not a darling of the church once you've read the lyrics to this song. The words and their translation into English can be found here. This is the best known troubadour song from the repertoire and was well known to musicians and scholars, even referenced by Dante in his Paradiso. Listen for the strophic form of this music. Can you hear the repetitions of the poetic form and music? The words and a translation to English can be found here. This type of polyphony may be familiar from songs like Frere Jaques and Row Row Row Your Boat, where the same melody is sung against itself at different timings. This is an early for of Imitative Polyphony known as a round. Listen to for the imitation bbetween the different voices - how many voices are involved in each section where the round is sung? Sing cuccu nu • Sing cuccu. Sing, cuckoo; sing, cuckoo, now! How do the troubadour songs and the popular tune compare to the church music we've listened to? What does this music achieve in terms of its expressivity? "After 1300 the technical development of polyphony reached new heights of sophistication. Composers and music theorists of the time began to speak of an ars nova, a “new art” or “new technique.” ... the organum of the Notre Dame composers, now many years old, was regarded as “ancient art,” ars antiqua. Some historians have compared the fourteenth century with the twentieth, for it was a time of the breakup of traditions — an age of anxiety, corruption, and worse. Bubonic plague, the “Black Death,” carried away an estimated 75 million people, at a time when the papacy had been thrown out of Rome and two rival popes claimed the allegiance of European Christendom. Polyphonic music grew increasingly secular, intricate, and even convoluted, as did the painting, architecture, and poetry of the time. Motets reflected such intricacy in a structural technique they employed called isorhythm. Here rhythmic patterns many notes long were repeated over and over — isorhythm means equal rhythm — but with different pitches each time. This went along with other schematic and numerical procedures, meant for the mind rather than the ear. Mathematics was also making great strides in this period. The leading composers, Philippe de Vitry (1291–1361) and Guillaume de Machaut (c. 1300 –1377), were both churchmen — Vitry ended his life as a bishop — but they were political churchmen serving the courts of France and Luxembourg. Machaut was also the greatest French poet of his time, admired (and imitated) by his younger English contemporary, Geoffrey Chaucer." An example of a secular isorhythmic motet, In Arboris presents a level of rhythmic and polyphonic complexity that is beyond what we've heard from the early Notre Dame composers of the Ars Antiqua era. De Vitry is attributed with the development of the isorhythmic technique, where independent patterns of notes (color) and rhythm (talea) repeat in non-coincidental combinations, creating a self-similar but non-repeating structure. For example, imaging a melody with four pitches, like the opening of Twinkle Twinkle Little Star, then imagine these four notes repeating with a long-short-short rhythmic pattern, resulting in a larger-scale repetition every twelve notes (4 pitches by 3 rhythmic durations). Even with these small numbers, there is already an interesting effect; the motets of this era that use the isorhythmic technique are often much more complicated than a simple 4 over 3 pattern. De Vitry is also known for his music theory treatise Ars Nova, where he lays the foundations for modern rhythmic notation and meter. While the basic ideas of this treatise are still in practice today, De Vitry and his contemporaries used red or black ink to signify if the notes should have a 2 or 3 notes in a beat duration. Guillaume de Machaut's Mass for Notre Dame is notable as the first complete mass written by a single composer. Up to the point, the mass would be pieced together without any necessary connection between the different sections. This mass marks the first instance of a composer conceiving of the Ordinary Mass as a coherent large-form composition. This Kyrie uses a cantus firmus, which is a melody taken from the another composition (often plainchant) that is then used as the basis of the polyphonic vocal writing. In the case of this mass, it is very difficult to hear the cantus firmus as it is deeply embedded in the musical texture. The method of building a composition around a pre-existent melody is a continuation of the organum tradition we heard from Leonin and Perotin last class. Like the motet of Philippe de Vitry, this Kyrie is isorhythmic. Guillaume Dufay (1397-1474) was a franco-flemish composer of the early renaissance. This is an example of a homorhythmic motet. Note that there is not a lot of listening for this class, but the two central pieces, Solo e Pensoso and Moro Lasso, are incredibly dense in every sense of the word. Please listen to these pieces at least twice! Josquin Desprez (1450-1521) is considered to be the first master of the high renaissance. Josquin was born in northern France, travelling to Italy in his early life. Josquin's patrons included Pope Alexander VI, the notorious Sforza family of Milan, the Estes of Ferrara, Louis XII of France. "An amazingly imaginative composer, Josquin brought the fiffteenth-century Mass to a brilliant climax and pioneered whole new expressive genres, such as the sixteenth-century chanson and motet. He was famous both for his technical prowess and for his expressive innovations — for the prayerful serenity of his motet “Ave Maria” as well as the grief-stricken accents of “Planxit autem David,” a setting of King David’s lament for his dead son Absalom." Josquin's early motet, Ave Maria, of which we will hear a live performance of in class, is an excellent example of Imitative Polyphony. The two pieces of music for this class mark the height of the renaissance madrigal, a secular polyphonic form that is known for a high degree of chromaticism and an inventive use of word painting (madrigalisms). Luca Marenzio sets the poem Solo e Pensoso I Piu Deserti Campi by the 14th century Italian poet, Petrarch. This work comes from a book of madrigals, Il Nono Libro de Madrigali, which is the final collection of madrigals from Marenzio and represents his most complex and mature work. Follow the text as you listen to the music and consider how the text, in terms of both the meaning of the words as well as the overall form of the poem, may have influenced the music. How does Marenzio treat words like "alone" or "life," or "love" in his music. The text is taken from Petrarch's book of 366 poems, la canzonierre - a set of very inward looking poetry, representing a journey into the self. To get an idea of what this means, please read the very first poem from this collection, which refers to the collection as a whole, setting up the reader for the poetry and its themes. ove vestigio human l'arena stampi. any place where human footsteps mark the sand. they see from outside how I flame within. of my life, hidden from others. speaking with me, and I with him. Go back and listen to the first minute of this madrigal for a second time - what is happening with the highest voice? What might this voice represent? Carlo Gesualdo di Venosa is the composer to have taken the renaissance polyphonic style to its furthest extreme in terms of complexity and chromaticism. The music of Gesualdo is often considered to be disturbed and dark in character, an observation reinforced by his biography: Gesualdo suffered from possible mental illness and violent tendencies that culminated in the murder of his wife and her lover after catching the two lovers in the act. It could be argued that Gesualdo was consumed by guilt from this murder and his music became a conduit for his tortured mental state. Moro lasso al mio duolo is written from the perspective of a lover dying of grief and longing. The music contains rapidly shifting moods and musical textures. The opening line is homophonic, where all voices move together in rhythmic unison. After this first line of text, the music shifts to a more energetic section where the different voices move rapidly and independently from one another. Listen to this music while following the text. How does the music coincide with the text? Are the words and their meaning somehow conveyed musically? Are there any similarities and differences between this madrigal and the one by Marenzio? Ahi, che m’ancide e non vuol darmi aita! Go back and listen to the series of chords in the opening section of this piece - do they sound anything like the music we have heard up to this point? Gesualdo was known to have experimented with microtonal tunings for his music. There is some evidence that his music should be performed in 31-tones per octave as opposed to the usual 12-tones per octave that we have on the piano. At the time Gesualdo was working, the modern way of tuning instruments was not yet widespread, and there were many people experimenting with different ways to tune a keyboard instrument all over Europe. Gesualdo's contemporary, Vicentino, invented the 31-tone per octave system that Gesualdo favored, which can be heard in this recording. Under the patronage of Count Giovanni de Bardi, the Florentine Camerata were a group of humanists, poets, scholars, and musicians who convened to discuss art, music, and drama. Their ideas would lead to the invention of opera as we know it, built upon the drive to recreate ancient Greek drama, a form that had been lost for many centuries. The theories of the Florentine Camerata led to the development of monody, which focuses on the a recitative style, a declamatory way of singing that approximates the patterns of human speech. While some early experimental works would be limited to monody and the recitative style throughout the entire opera, composers soon opted to move towards greater musical variation, contrasting sung sections, known as arias, as well as choral and instrumental passages with the recitative. The shift towards a single vocal line marks a path away from the heights of polyphonic complexity found in the motets and madrigals we've studied in class and towards simplicity, with an emphasis on a clear and understandable setting of the text. After all, the goal was to revive the ancient Greek musical drama, to tell a story that is heightened by music. Members of the Florentine Camerata included the Giulio Caccini, Pietro Strozzi, and Vincenzo Galilei (the father of astronomer Galileo Galilei), and Claudio Monteverdi. This opera features a libretto by Alessandro Striggio based upon the Greek myth of Orpheus. With the supernatural musical skills of Orpheus, this legend makes an attractive choice for opera. Orfeo is in five acts and contains instrumental sections, recitative, arias, and choruses. For the libretto, Striggio draws mainly upon the Virgil and Ovid versions of the Orpheus myth. The only great divergence from the original myth occurs at the ending, where in this version Apollo descends from the heavens and invites Orpheus to join him in eternal life, an excellent example of the use of "Deus Ex Machina," imposing an happy ending. Please read this summary of the Orpheus Myth if you are not already familiar. Orfeo is notable as the first opera that is still widely performed today. This opera was premiered in 1607 at the court of Mantua. Monteverdi's goal was to recreate the ideals of ancient Greek musical drama, to give priority to the expression of feelings and the portrayal of passions through the marriage of music and words. Although this opera is in five acts, the original intention was to have no break between acts and the music be performed continuously. A complete libretto with english translation can be found here (optional). Listen to the five sections provided below and identify what marks the different sections as recitative, aria, chorus, or instrumental. Why would certain parts be in one style and not another? Does this music remind you of anything you've come across outside of the course (musicals, opera, albums, etc.)? Che sian degni d’ORFEO nostri concenti. Per queste selve hà sospirato, e pianto. May our singing be worthy of ORFEO. Sighed and wept throughout these woods. Recitative sections were only notated in a limited, short-hand form for the instruments. The musicians would only have the chord changes with the bass note and would be expected to improvise their parts with this basic level of information. Listen to how these particular performers realize this accompaniment. Does it sound improvised in some way? How do you think it was possible to work in this way and have predictable results? Per mai più non tornare, ed io rimango? Rimarrò teco in compagnia di morte. A dio, terra, à dio Cielo, e Sole à dio. You are dead, my life, and I still breathe? Never to return, and I should remain? I will stay with you, in the company of death. Farewell earth, farewell Heaven and Sun, farewell. Listen closely to the vocal line - how does this compare to the vocal writing and text setting of the madrigals and chanson we've heard thus far? Is it more expressive somehow? Are the words easily understandable? Does the accompaniment have a clear relationship with the voice? Nè contr’ a lui più sa natura armarse. Arò gli ondosi campi, e ’l seme sparse Di sue fatiche, ond’ aurea messe accolse. Che sprezzò d’Austro e d’Aquilon lo sdegno. Nor against him can Nature further arm herself. Of his labors, whence he has gathered golden harvests. Who disdained the wrath of the South and North Winds. In the instrumental section what instruments do you hear and what are their roles? How does the orchestration change when the chorus enters? O dolcissimi lumi io pur vi veggio, Io pur: ma quale Eclissi ohimè v’oscura? Così per troppo amor dunque mi perdi? Tè d’ogni ben più caro, o mio Consorte. Ch’ormai fia sordo a’ prieghi tuoi l’Inferno. Ma chi me ’l niega, ohime: sogno o vaneggio? I see: But what Eclipse, alas, obscures you? You have broken the law, and are unworthy of grace. So, through too much love, then, do you lose me? You, dearer than all, O my Consort. For from this moment Hades is deaf to your prayers. But, who stops me, alas: do I dream or rave? What effect does this section, with a good deal of text in a recitative style, have? Is it closer to something like musical theater than a typical opera passage? The opera ends with a final chorus, a setting of the biblical moral from the Book of Common Prayer: "He who sows in tears shall reap the fruit of grace". L’ave ben non mai vien meno. Noi t’offriam lieti e devoti. D’ogni grazia il frutto coglie. The opera ends with this celebratory music. Listen to the form of this music, the alternation between the chorus and the orchestra. What texture is Monteverdi using in the chorus? Who is singing in this opening section of the opera? Does the orchestra sound like a modern orchestra? If not, why? Up to this point in the course we have been listening almost exclusively to vocal music, and with the connection to the hegemony of the church and the emphasis on music being a vessel for the meaning of the sung text, instrumental music in the medieval and renaissance eras was less prominent, or at least not as well preserved. In the Baroque era, however, instrumental music began to be taken much more seriously and a wide range of instrumental musical forms arose. This may also relate to technology and the greater availability of high quality instruments like the harpsichord and the family of bowed stringed instruments that we still use today. Furthermore, musical notation at this point had become firmly established and looked more-or-less as it does today, allowing for more complex and elaborate instrumental music. In 1723 Bach was appointed cantor of St. Thomas’s Church in Leipzig, a center of Lutheran church music in Germany. He had to not only compose and perform but also organize music for all four churches in town. Teaching in the choir school was another of his responsibilities. Almost every week in his first years at Leipzig, Bach composed, had copied, rehearsed, and performed a new cantata — a religious work for soloists, choir, and orchestra containing several movements and lasting from fi fteen to thirty minutes. Bach chafed under bureaucratic restrictions and political decisions by town and church authorities. The truth is, he was never appreciated in Leipzig. Furthermore, at the end of his life he was regarded as old-fashioned by modern musicians, and one critic pained Bach by saying so in print. Indeed, after Bach’s death his music was neglected by the musical public at large, though it was admired by composers such as Mozart and Beethoven. Bach had twenty children — seven with his first wife (a cousin) and thirteen with his second (a singer), for whom he prepared a little home-music anthology, The Note-Book of Anna Magdalena Bach. The children were taught music as a matter of course, and also taught how to copy music; the performance parts of many of the weekly cantatas that Bach composed are written in their hands. From his musical response to the sacred words of these cantatas and from other works, it is clear that Bach thought deeply about religious matters. Works such as his Passions and his Mass in B Minor emanate a spirituality that many listeners find unmatched by any other composer. Bach seldom traveled, except to consult on organ construction contracts (for which the fee was often a cord of wood or a barrel of wine). Blind in his last years, he continued to compose by dictation. He had already begun to assemble his compositions in orderly sets: organ chorale preludes, organ fugues, preludes and fugues for harpsichord. He also clearly set out to produce works that would summarize his final thoughts about Baroque forms and genres; such works are the Mass in B Minor, the thirty-three Goldberg Variations for harpsichord, and The Art of Fugue, an exemplary collection of fugues all on the same subject, left unfinished at his death. Bach was writing for himself, for his small devoted circle of students, perhaps for posterity. It is a concept that would have greatly surprised the craftsmen musicians who were his forebears." The first part of this recording is a prelude, featuring continuous arpeggios of a harmonic progression. Traditionally, the prelude could be used as a way to warm up on, or even tune in the case of something like a lute, the instrument. The second portion is a fugue, a composition form that grew out of imitative polyphony with strict guidelines regarding how the contrapuntal lines may interact. The part of the fugue that repeats at different notes and timings is called a "subject". The fugue is considered to be one of the most complex forms of musical composition and J.S. Bach took this form to extreme degrees and was greatly interested in the compositional challenges it put forward. Towards the end of his life,Bach worked on a set of pieces entitled The Art of the Fugue, which aimed at exploring the depths of the fugal form. How do the prelude and fugue differ in terms of either musical or experiential qualities? Are any of the harmonic changes in the prelude surprising to you? In the fugue, are you able to pick out the four entries of the subject? In the baroque era composers began writing suites, a set of pieces or movements that would cohere together into a unified whole. Composers conceived of these pieces as all being part of a larger work, where contrasting tempos, keys, and even contrasting regional styles would be planned out to create connections on a larger scale. For example, many suites were in three movements that would be in a fast-slow-fast structure. Bach composed his six Brandenburg concertos in 1721 for the purposes of seeking patronage from the Margrave of Brandenburg, unsuccessfully as the court did not have the required musicians to perform the scores. These concerti were left unperformed for during Bach's lifetime. Despite this disappointing initial reception, these concerti and now considered to be among the finest works from the Baroque era. All six concerti are in the form of concerto grosso, where a collection of instruments share solo roles accompanied by an ensemble. The solo group is known as the concertino while the orchestra is known as the ripieno. When all the instruments play together, concertino and ripieno alike, this is known as a tutti section. The first movement begins bombastically, with a focus on the harpsichord as soloist. This movement is in ritornello form, with the solo harpsichord playing episodic material between the tutti ritornello sections. At roughly two-thirds through the first movement there is a lengthy harpischord cadenza. This is the first piece to use the harpsichord in a solo capacity. A slow movement is once again in ritornello form. The third movement is in a fast tempo and in the form of a da capo aria, a ternary (ABA) form. While the da capo form is normally a vocal form, in this case the soloists take the role of the voice. To provide an idea of the physicality of the instrumental ensemble, please have a look at this video of the Freiburger Barockorchester. They perform this work using period instruments and it's amazing to see the virtuosic performance of the solo harpsichord part. Handel studied law for a year at Halle, one of Germany’s major universities, before finally joining the orchestra at Hamburg, Germany’s leading center of opera. From then on, it was an exciting, glamorous life. Still in his teens, Handel fought a duel with another Hamburg musician about which of them was to get top billing. In 1706 he journeyed to the homeland of opera and scored big successes in Venice, Florence, and Rome. Though he became a court musician for the elector of Hanover, in northern Germany, he kept requesting (and extending) leaves to pursue his career in London, a city that was then beginning to rival Paris as the world capital. Here Handel continued to produce Italian operas, again with great success. He also wrote a ﬂattering birthday ode for Queen Anne and some big pieces to celebrate a major peace treaty; for this he was awarded an annuity. In 1717, after the elector of Hanover had become George I of England, Handel got back into his good graces by composing music to be played in a royal celebration on barges on the River Thames. This famous Water Music consists of two suites for the Baroque festive orchestra. As an opera composer, Handel had learned to gauge the taste of the public and also to ﬂatter singers, writing music for them that showed off their voices to the best advantage. He now became an opera impresario — today we would call him a promoter — recruiting singers and negotiating their contracts, planning whole seasons of opera, and all the while composing the main attractions himself: an opera every year, on average, in the 1720s and 1730s. He also had to deal with backers — English aristocrats and wealthy merchants who supported his opera companies and persuaded their friends to take out subscriptions for boxes. Handel made and lost several fortunes, but he always landed on his feet, even when Italian opera went out of style in Britain, for he never lost a feel for his audience. After opera had failed, he popularized oratorios — retellings of Bible stories (mostly from the Old Testament) in a half operatic, half choral form. Opera audiences had always been ready to identify opera’s virtuous Roman emperors with local princes. Now they were delighted to identify oratorio’s virtuous People of Israel with the British nation. Handel was a big, vigorous man, hot-tempered but quick to forgive, humorous and resourceful. When a particularly temperamental prima donna had a tantrum, he calmed her down by threatening to throw her out the window. At the end of his life he became blind — the same surgeon operated (unsuccessfully) on both him and Bach — but he continued to play the organ brilliantly and composed by dictating to a secretary. Handel’s oratorio, Messiah, his most famous work, is also one of the most famous in the whole of Western music. It is the only composition of its time that has been performed continuously — and frequently — since its first appearance. Today it is sung at Christmas and Easter in hundreds of churches around the world, as well as at symphony concerts and “Messiah sings,” where people get together just to sing along with the Hallelujah Chorus and the other well-known choral numbers, and listen to the well-loved arias. Unlike most oratorios, Messiah does not have actual characters depicting a biblical story in recitative and arias, although its text is taken from the Bible. who react to each of the episodes by singing recitatives and arias. All this is rather like an opera in concert form; but in addition, the chorus has a large and varied role to play. On one occasion, it sings the words of a group of angels that actually speaks in the Bible. Sometimes it comments on the story, like the soloists. And often the choristers raise their voices to praise the Lord in Handel’s uniquely magnificent manner. " The enlightenment saw an increased level of education among the common people and a general diminishing of power in the clergy, and this liberal atmosphere, combined with colonial wealth, allowed for a flourishing in culture and the arts. Vienna was an important center during this era, being ideally situated in the center of Europe both politically and geographically. Vienna attracted the three most important figures of the classical era of music: Joseph Haydn (1732-1809), Wolfgang Mozart (1756-1791), and Ludwig van Beethoven (1770-1827). Emperor Joseph II, who reigned in Austria briefly from 1780-1790 supported the free press and was an avid patron for the arts. During this time, with a populated of roughly 150 000 people, Vienna supported over 300 newspapers or journals. 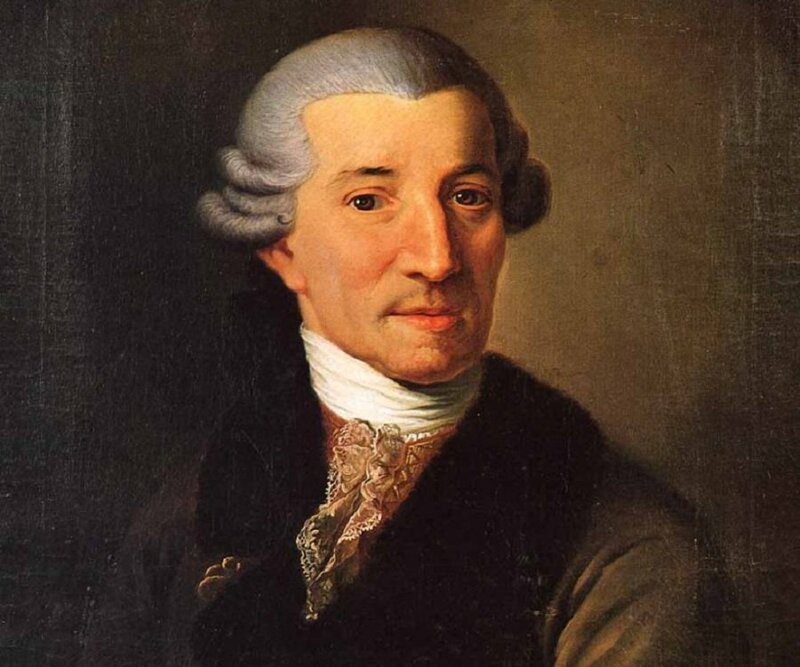 It was during and around these years that Joseph Haydn worked for the Esterhazy family of the nearby estate of Eisenstadt and became known as one of the greatest living composers. The two other composers from the classical era that we will look at also came to Vienna around this time: Mozart moved to Vienna from Salzberg in 1781 and Beethoven in 1792 from Bonn, Germany. The enlightenment era brought about the emergence of an educated middle class and with this came the amateur musician, the public concert, and a greater desire for culture as entertainment. The invention of the modern novel, grand opera, and the symphony all occur around this time, and as Europe pushed towards rights, freedoms, and democracy, the patronage system of the courts made way for a concert-going public. Furthermore, pianos or other keyboard instruments became part of many households and with this came a demand for parlor music and simpler pieces written for amateurs. As the surface elements of classical music became simpler, emphasizing so-called natural and easily comprehensible music, the question of how to create a substantial piece of music from a simple melody and chord progression arose. This problem gave rise to more elaborate musical forms created through repetitions, contrasting sections, elaboration of elements, and variation of musical materials. If you recall ritornello form from last class, this is a perfect example of a musical form from the Baroque period. The most prominent forms employed throughout the Classical era were the rondo, theme and variations, sonata form, and minuet. All of these forms existed in earlier periods, but they become more complex in the Classical era. The standardization of musical forms in combination with more comprehensible melodies created strong expectations for the listener.Composers could now create sensations like a sense of closure, delayed gratification, and surprise through an interaction with the expectations set up by a standard form. Read this short Chapter from Listen describing the classical symphony and sonata form. This class will focus on two works by Joseph Haydn (1732-1809), an important figure from the classical period and a teacher to both Mozart and Beethoven. While he is often overshadowed by these two students of his, Haydn is considered as the founder of the symphony and the string quartet in terms of both their importance as a combination of instruments as well as the normative 4-movement structure that composers employed for centuries. Haydn was experimental in his approach, always pushing the boundaries of musical form and playing with the listeners expectations. This experimentation may have only been possible because he worked under the patronage of the Esterhazy family in a remote area of Austria for the greater part of his life with an orchestra of talented musicians at his disposal. The two works that we are listening to this class are substantial in length, but please listen to them in their entirety so that you can develop a sense of their large-scale 4-movement structure. The first movement is in sonata form. Sonata form is an elaborated ABA structure with an exposition, development, and recapitulation. 3:30 - A "false recap"
The second movement is a scherzo (in 3 time, like a minuet but generally quicker). The movement has an ABA large-scale form. The third movement is in a slow tempo in a contrasting minor key. Like the first movement, this slow movement is in sonata form. This string quartet is known as "The Joke" quartet because of the humorous play with audience expectations in the fourth and final movement. There are several false endings, making it unclear if the music has concluded or if the players will go on. The form of this movement is a rondo, where the theme returns again and again. The rondo form was very popular at the time Haydn composed this work, and he may have been poking fun at the predictability of the form. As a court composer, Haydn wrote an incredible amount of music; perhaps experimenting with musical form was a way for him to maintain his interest (or sanity). The rondo form is very similar to the ritornello form we saw in the Baroque period with the Brandenberg Concerto No. 5 by J.S. Bach. The difference between the two forms is subtle: the refrain in a ritornello may be in different keys and only return to the tonic (home) key for the final refrain, whereas in the rondo form the refrains are always in the tonic key. In other words, the refrain in a rondo will sound the same each time it comes back. How does this piece create contrast both in terms of the music we've heard from the Baroque era as well as the sense of musical drama that is created within the piece? The symphony took on an important role in the second half of the 18th century. While the orchestra was not a new invention of the classical era, the instrumentation became more standardized and the basic makeup of the modern orchestra was now in place. The classical orchestra was more flexible and versatile than in the Baroque era, and it was also the grandest and loudest ensemble of the era and would continue to be until the invention of the loudspeaker. - First movement: fast or moderate tempo, sonata form with or without introduction. - Second movement: slow movement, can be in a variety of forms such as sonata, theme and variations, rondo, or others. - Third movement: in 3 time, a minuet or scherzo with a moderate tempo. - Fourth movement: the finale, a fast or very fast tempo, in sonata or rondo form. Haydn's last Symphony is known as the "London" symphony, as it was the last in a series of twelve symphonies written for English audiences. The first movement of the symphony is again in Sonata form. The first movement leads off with a slow introduction in the tonic minor key. The slow second movement is in sonata form. Following the traditional scheme, the third movement is a minuet and trio. Haydn concludes the symphony on a powerful and jubilant note with a finale in a quick tempo, again in sonata form. The Enlightenment ideal of “pleasing variety” was a secondary issue when it came to Classical melody. Rather the demand was for plainness, for relief from the complex, richly ornamented lines of the Baroque period. When people at the time demanded “natural” melodies, what they meant were tunes: uncomplicated, singable melodies with clear phrases (and not too many of them), melodies with easily grasped parallelisms and balances. works, as we will see in a moment. Nevertheless, by comparison with a Baroque concerto, a Classical symphony leaves listeners with a good deal more to hum or whistle as they leave the concert. Indeed, entire tunes were often worked into larger compositions. For example, variation form (theme and variations) grew popular both for separate pieces improvised by virtuosos and for movements in multimovement genres. Haydn wrote variations on the Austrian national anthem (he also wrote the tune), and Mozart wrote variations on “Twinkle, Twinkle, Little Star,” in its original French version, “Ah vous dirai-je, maman” (“Oh mama, I must tell you”). Occasionally, popular songs were even introduced into symphonies. There is a contemporary opera tune in Mozart’s “Jupiter” Symphony, the last he composed, and one of his greatest." Among a small number of Mozart's symphonies written in a minor key, the 40th symphony has been described as “a work of passion, violence and grief” by Charles Rosen and "a symphony of pain and lamentation" by biographer Otto Jahn. This symphony is one of Mozart's last compositions and is known as "the great" symphony. In some ways it marks a look forward to the focus on personal expression to come in the romantic era. The first movement begins with the accompanimental figure before the first theme enters. Mozart marks the opening thee at a quiet dynamic, which is unusual for the period. The first movement is in sonata form. The second movement is slow and lyrical, also in sonata form. The Minuet and trio is unusually brash and intense, removed from the courtly minuets of the Baroque and early classical works. "In the finale we find some of the fiercest, most fiery writing Mozart ever composed. As in the first movement, the drama derives from the endlessly fascinating ways in which melodic fragments are tossed about, from how the music ventures through remote harmonic regions with almost reckless abandon, and from the constant sharp contrasts of loud and soft, of full and sparse instrumentation, and of stable and unstable harmony. "But for all the anguish Mozart still feels and expresses," writes musicologist Michael Steinberg, "and even though it is in this movement that he brings his language closest to the breaking point, the finale must at the last be a force that stabilizes, sets solid ground under our feet, seeks to close the wounds, and brings the voyager safely-if bruised-into port." Please read these concert notes for the Magic Flute for context. Compare this this style of vocal writing to other pieces with voice that we've heard in the class. How would you characterize Mozart's approach to vocal writing? Do you hear any recitative in this opera? The overture of an opera is the instrumental section that begins the work and precedes any action onstage. The overture serves to mentally prepare the audience for what is to come and suggest some of the themes of the opera. Listening to the overture to the magic flute, what do you expect from the story to come? Does it suggest a tragedy or a comedy? What might the instrumental music suggest? Listen through the variations and try to identify what each variation entails. For instance, is the melody still present and if so, what range is it played in and is it altered in some way? Has the music shifted to a minor key? Are there new elements added to the music? First, you will hear the recognizable theme in a simple ABA form. Using the english setting of this tune, the A section is the "twinkle twinkle little star, how I wonder what you are" part and the B section is the "up above the world so high, like a diamond in the sky" part. Following the theme you will hear the first variation, which retains the ABA form, but the melodic line is now moving rapidly. The piece then continues with the third variation, where the bass part now moves rapidly and the melody returns to the slower pace of the theme. Continue listening from hear and try to identify and describe variations 4 through 12. The Theme and Variations form was an ideal vehicle for improvisation and the Viennese elite would hold improvisation contests between pianists. Mozart and Beethoven were both renowned for their improvisational prowess, and Beethoven would best every pianist in Vienna in these competitions. The theme and variations form would allow for improvisers to show off both their ability to perform virtuosically on the instrument as well as their compositional technique in a way that the audience could understand (provided they can remember the theme). Listen to the first 5 variations and then skip ahead to an hour in to hear the 33rd and final variation! You'll be able to follow what variation you are hearing by the titles written on the score shown in the video. "We present here to the world Variations of no ordinary type, but a great and important masterpiece worthy to be ranked with the imperishable creations of the old Classics—such a work as only Beethoven, the greatest living representative of true art—only Beethoven, and no other, can produce. The most original structures and ideas, the boldest musical idioms and harmonies are here exhausted; every pianoforte effect based on a solid technique is employed, and this work is the more interesting from the fact that it is elicited from a theme which no one would otherwise have supposed capable of a working-out of that character in which our exalted Master stands alone among his contemporaries. The splendid Fugues, Nos. 24 and 32, will astonish all friends and connoisseurs of serious style, as will Nos. 2, 6, 16, 17, 23, &c. the brilliant pianists; indeed all these variations, through the novelty of their ideas, care in working-out, and beauty in the most artful of their transitions, will entitle the work to a place beside Sebastian Bach's famous masterpiece in the same form. We are proud to have given occasion for this composition, and have, moreover, taken all possible pains with regard to the printing to combine elegance with the utmost accuracy." The Wikipedia page for this work is surprisingly detailed, breaking down each variation. Please read these concert notes for historical context. The Eroica (heroic) Symphony represents the beginning of Beethoven's middle period, pushing forward with a new penchant for meaning and expression in music and away from the classical tradition of Haydn and early Mozart. Originally, this symphony was written with a dedication to Napoleon Bonaparte, whom Beethoven believed was heralding in an age of democracy. 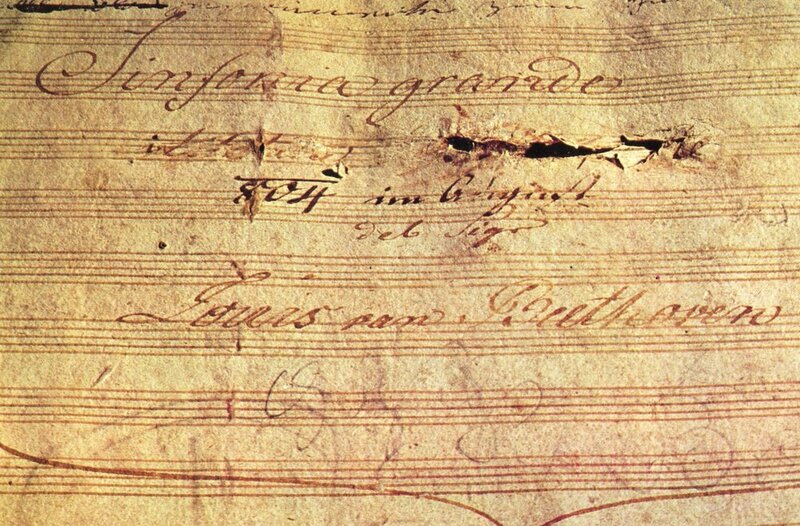 After Napoleon betrayed this cause and crowned himself emperor, Beethoven removed the dedication; the crossing and tearing out of Napoleon's name from the front page of the score is testimony to the emotional temperament that Beethoven was known for. The scholar interviewed in the NPR segment relates the music to the idea of a battle, followed by burying the dead, and finally reclaiming joy. There are many possible interpretations of the meaning of this work. Do you hear a narrative in the music? The first movement, Allegro Con Brio, is in sonata form. The first theme is played by the cellos after the two introductory chords. Listen carefully to this short melody and try to recognize it throughout the movement, as Beethoven is a composer known for his economical use of melodies, you will hear it repeated, recontextualized, and transformed many many times. Try to identify the sections of the Sonata form as you listen, noting that the development section and coda are both much longer and more elaborate than in the works by Mozart or Haydn we've analyzed. The second movement, Marcia Funebre – Adagio assai, is a funeral march in ternary (ABA) form that is elaborated in a way to make it also give the impression of a rondo, where the principal theme of the funeral march returns several times. The third movement, Allegro Vivace, is a rapid scherzo and trio. The fourth and final movement is in the form of a theme and variations, an unusual choice for a symphonic work. Read pages 110-128 of this Chapter on Beethoven 9 from Thomas Kelly's First Nights. Beethoven wrote only 9 symphonies (many fewer than Mozart or Haydn), but each symphony is distinct and creates a whole musical world for itself, unique in tone and bursting with character. While the third symphony presented a dramatic and heroic journey, the ninth symphony seems to look beyond heroes and towards the empowerment of the people and a search for universal truths. The music itself is revolutionary, no longer was the instrumental form enough for Beethoven to express his ideas, he added a chorus and vocal soloists in the final movement for the Ode to Joy. The first movement is in Sonata form, but without a repeated exposition. The music seems to begin in an almost ambient way, very aimless, even suggesting that the orchestra may still be tuning up. Listen for the recapitulation - what has changed ? Deviating from the norm, Beethoven changes the order of the movements, making the second movement a scherzo and the third movement the slow movement. The fourth movement is about 25 minutes in duration and is a mixture of forms, beginning with a theme and variations, followed by a scherzo, followed by a slow section, and finally ending with a fugue. In this way, Charles Rosen considers this movement to be a symphony within a symphony. Wir betreten feuertrunken. Himmlische, dein Heiligtum! Alle Menschen werden Brüder Wo dein sanfter Flügel weilt. Wer ein holdes Weib errungen, Mische seinen Jubel ein! Und wer's nie gekonnt, der stehle Weinend sich aus diesem Bund. Alle Guten, alle Bösen, Folgen ihrer Rosenspur. Wollust ward dem Wurm gegeben, Und der Cherub steht vor Gott! Laufet, Bruder, eure Bahn, Freudig, wie ein Held zum Siegen. Seid umschlungen, Millionen. Dieser Kuss der ganzen Welt! Bruder! Uber'm Sternenzelt Muss ein lieber Vater wohnen. Ihr sturzt nieder, Millionen? Ahnest du den Schopfer, Welt? Such ihn uber'm Sternenzelt! Uber Sternen muss er wohnen. Friends, no more of these tones! Intoxicated with your fire, heavenly one, we enter your shrine. All men become brothers where your gentle wing rests. Whoever has taken a loving wife, let him join us in celebration! Yes! Even he who hasnothing to callhis own but his soul! Be he who cannot rejoice, let him steal weeping away. Dispensing kisses and wine to us, a friend tested in death. The worm is ecstacy, and the cherub stands before God. Through the heavens, as joyful as a hero on his way to triumph. Be embraced, you millions! Here's a kiss for all the world! Brothers! above the canopy of the stars there must dwell a loving Father! Do you fall to your knees, you millions? World, do you sense your Maker? Seek him beyond the stars! Beyond the stars he must dwell! Beethoven's music is traditionally organized as three stylistic periods. The first, dating until about 1800, is Beethoven's early style, building on the work of Mozart and Haydn in the Classical idiom. The second, or middle, period goes until about 1918 and covers the characteristically "heroic" works like the Eroica Symphony. The third, mature period becomes more introspective in nature and the tone of heroism recedes. This introspective character is best understood through chamber music, music played in an intimate setting rather than the public spectacle of the symphony. Beethoven's late string quartets went largely ignored at the time of their composition, the exploration of form and harmony was extremely experimental for the time and was simply too much for many listeners and critics. However, two centuries later these are among Beethoven's most celebrated works. These late quartets are also largely responsible for the enduring importance of the string quartet and for centuries the string quartet became the space for composers to "prove" themselves and measure up against other great composers. It is difficult for us listening today to understand just how radical this music was at the time it was written. The music is also intensely difficult to play, still a challenge for professional string quartets. The harmonic and rhythmic language is also more jarring and unpredictable than any of the music we've come across up to this point. Listen through to the end of the first movement (9:20). This opening movement is suggestive of a sonata form with a slow introduction. Beethoven transforms sonata form to the extent where it is sometimes difficult to know where sections and themes begin and end, resulting in perhaps a more fluid musical experience. Compare this work to the Haydn string quartet we heard before the midterm - is anything strikingly different? Beethoven is renowned for his economical use of musical material - in other words, a short fragment of a melody might be used over and over again at different transpositions or in different contexts. Try to listen for these recurring musical motives and the musical economy that Beethoven is known for.